Here are the two suspected fake baggies I bought from Jeff within the last six months, one from Farthest From and one from eBay. laurencedyer wrote: I will add more substance to my inclusion in the coming day's as I have not been well the last week or so but thought it important to add this communication at this current point in time. Whilst finalising my Baggie run and trying to acquire the last four baggies in December 2015 I was after a Fett and Jeff sent this image of these different Fetts available. The Big Pick had not long happened and the Vader Case with the never had been seen complete set o ESB - b baggies came to light so naturally I was keen on the Fett. 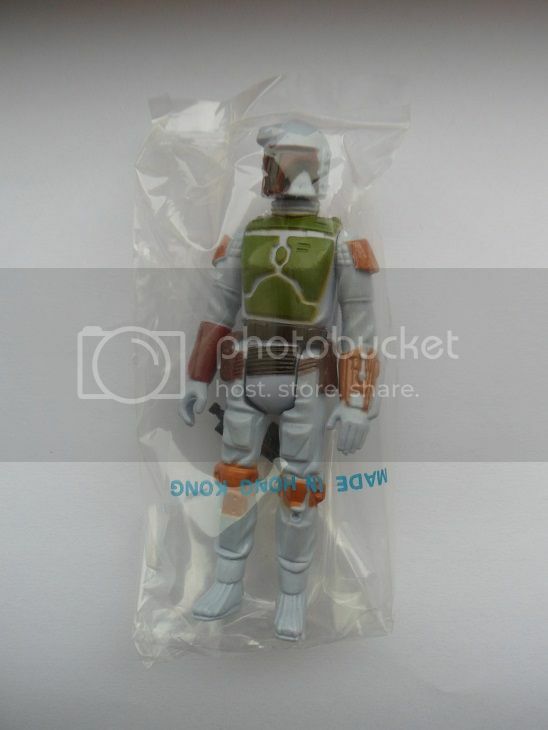 Jeff had stated in the correspondence below that this was the only one and that he had and that he had had this for over 5 year's but now he has had a supply of illegitimate looking ESB - b Fett baggies for sale this year. These where never previously in his collection from what he stated so where have they come from? 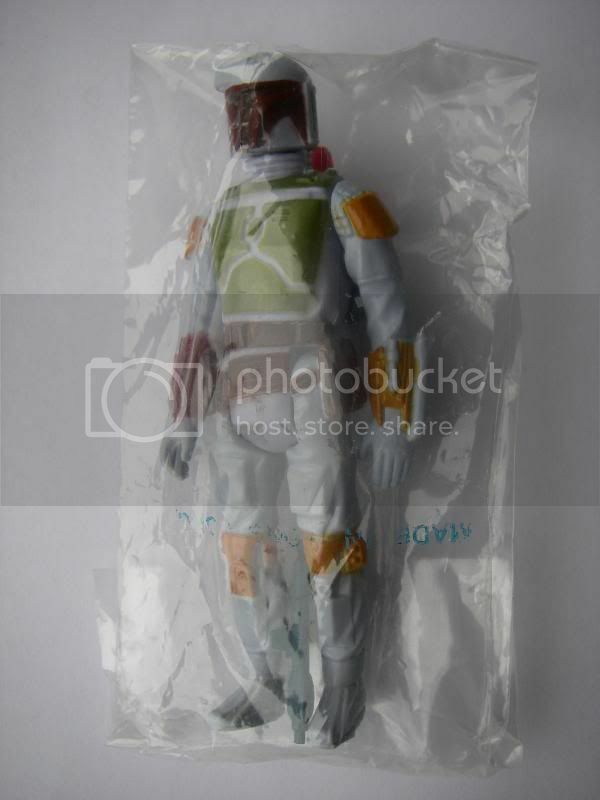 Frunkstar wrote: Indeed same baggies same text & yes all I know they are from a different toyline entirely, no star wars figures have ever been known or are ever likely to be in this kind of baggies, the only known example of a red text star wars is in a Macau red text baggie which is nothing like this thype & also stupidly rare. I know there is no date to confirm on the same of the others, but I know it was many months after I confirmed via email that they were not right,I assumed at the time Jeff would just open them & discard the baggies & as said had it not been for those red baggies being sold on after me informing him, I may never have looked in to Jeff's sales more closely or scrutinized the ones I had bought from him previously, several of which I still have including one of the 3 SW-a lando's I know he has sold in the past could of years, that alone was a point that had my alarm bells ringing like mad. You see the lando SW-a baggies is insanely rare, it was only ever issued for the ESB toy fair mock up stand of which maybe 10 or 20 at the most I would say were produced, of those only the ones actually used for the toy fair were suspected to have come with these SW-a baggies, all the others which were issued to salesmen as promo samples (if I do understand this correctly) came with the more readily available ESB-c baggies, so in essence there should theoretically only ever have been about half a dozen of them produced, so 3 to go through one persons seller account in a matter of a couple of years & me already owning one did not make a lot of sense to me. I decided to bit on the one he had listed on open auction on ebay & I won it at a really fair price, I was delighted as it was an upgrade for the one I had already, sadly that one I had already has a little tear in the baggies, it's taken me many years to put the full set of these 6 SW-a baggies together for the mock up stand, the huge loss for me above anything else it the one with thee tear I sold to a collecting buddy in Holland is legit, on close inspection the one I got is a fake, so now the set I worked one for many years is again incomplete with the likelihood of ever finding another genuine example is near impossible, I am saying all this as it's one good example of how a refund just does not cut it, yes I should have spotted this, but at the time I had a lot on & just put it on a shelf until well after I sold the other I had one by which time it's to late. There is simple no righting this as the set equates to thousands of pounds & many years years invested hunting ruined by one of the fakes. Below are some opinions from Frank (owner of what is believed to be the only known genuine example) on Jeff's light blue Fetts - In summary only one known example was confirmed, then suddenly Jeff has multiples all with differently painted figures, different coloured blasters, and baggies with the text in different places which seems incredibly unlikely if they all came from the same source at the same time. Frunkstar wrote: Further to Marty's post & before I go on at any length I would first like to say that if these tro logo fett's were refused a grade regardless of if they were opened by AFA (which BTW if they were real would be a travesty IMO) & have been refused a grade for obvious tampering - having clear signs of being repainted then a full refund should be issued under Jeff's "no questions asked refunds policy" IMHO - my thinking - if they had been fine they would have graded & there would never have been any need for a refund simple as that. It is worth noting that they differ in paint apps with one being a painted dart & the other unpainted even the paint colour of the yellow /mustard on the dart are, which to me would indicate they came from different batches, to me it also looks like at least one has touch ups to the belt, it is also worth nothing that the paint type used on the figures in the production process do not show up under a blacklight so even if it has been touched up at production due to bad take of the paint in the spray mask stage any further subsequent paint added would have not been viable under the black light as a different colour as the exact same paint type would have been used. Below are examples I have on the baggie guide which till now I just took as being cool paint app variations, I will get to my point about all this further down to summarize after pointing out bit's on each so please bear with me. So to summarize the above - these were all bought from the same place - Jeff, all 3 are different in terms of paint app's one has a different colour weapon & Marty's 2 are also different (paint app's & blasters) these were all offered for sale with mailer boxes which "quote by Jeff" came with them when I got them & offered up for sale with them so though maybe not stated as a tri fett mailer, the images would indicate so, can't remember if they were indeed listed as mailer or just with mailer boxes, though I am sure someone can can clear that point up for us, to me also quite an important issue is where the font placement is on them as well as the boxes being the incorrect size for any known & confirmed fett mailer be in kenner SW or ESB era or Palitoy as all know examples are identical in dimensions, the boxes offered with these are the same size as is associated with the Nien Nunb mailer. 1. till these turned up I owned the only ever confirmed palitoy-a tri logo fett which I will post a photos of below as a reference, I got it off long time baggie collector Del Hooper who was just selling up & getting out of the hobby when I was coming in to it, so it's been about a long time, it has the light blue blaster. 2. If these all came from the same place I.E Jeff bought them in for onward sale, then surely with the sum in question there would be some record of the transaction & a name of the seller as he had a lot of these I count 5 above alone & I know of at last one more owned by someone I know also from Jeff, most likely a great deal more of them as well that I do not know of, it's a recent transaction so must be some paper trail? 3. why if they all came from the same place would they have so many differences? ?, surely if they were from a single run which I would expect they were (hypothetical) then would not the entire batch be of the same paint applications as well as variation I.E all painted knee + unpainted dart + dark belt + same colour weapon for example??. 4. If they did indeed all come from the same batch would the bags not have also come from the same batch?, if so would the font not have been roughly in the same place on all of them give or take a few MM's as it the norm with batch runs off machinery. For the record I am not stating they are fakes, I am stating there are a great many "possible" red flags with a single batch of figures of the same type, which I find worrying as a collector of baggies. If however (speculation) they had been made up recently by "someone" not saying Jeff himself directly or maybe even indirectly as I simple do not have all the answers I would wish, but that would certainly explain the vast variations, does this not strike anyone else as a little odd at bear minimum??. I know there is by no means anything concrete or conclusive, but there are enough red flags for this to warrant full investigation IMO considering many of these changed hands at I think up to 750 quid a pop,so not small potatoes by anyone's standards. is also worthy of note that the oldest known example would seem to have a different top seal to any of these other examples from what I can tell from the photos alone. andrewneo17 wrote: I must start by qualifying I am a newly registered member of this forum though part of the initial investigation team. It has taken me a while to get on here due to work commitments and trying to get up to speed with the torrent of posts. Kudos to Frank, Edd, Mike and some of the other guys for taking flak for calling it out as it is. There are many in the investigation group whom are passionate about baggies and don't stand to gain other than to see a clean up for the good of the hobby. My dealings with Jeff started late last year when he listed a SW-a Han Solo and Lando on Ebay. I wrote to him offline to secure a deal for both, of which we now obviously know are fake. Not long after I went on to buy another 3 baggies from Jeff, a ESB-c Yoda, ESB-f Han and a Pal k (or rotj-j) Tusken Raider. As my location is in Singapore, I requested Jeff to send them to Frank instead. He did for the Yoda and Han but funnily enough (at that point), he chose to send the Tusken Raider to me in Singapore instead which obviously cost him 3 times more. I remarked at that time to Frank why would somebody do that. That kicked off my suspicion and upon having the baggie in hand, conferred with Frank and we pretty much came to a consensus the TR was a fake as did the Sw-a Han and Lando (of which both these were sent directly to me as I paid for the international postage). On the other hand, sure enough the ESB-f Han and ESB-c that were sent to Frank were legit. I will leave it to the group to make their own conclusions whether Jeff intended this all. I highly suspect he knows what he is doing, picking specific baggies to send to Frank and what not to, to avoid being called out. Richard_H wrote: I'm going to put a transcript of comments from the podcast here for historical purposes. This may take a while (I've lots to do) so bear with me. It will just be the facts and not the waffle. Here's the first question I will tackle as it's the most damning at the moment. Jeff - I've never sold a baggie with red text....I've sent pictures... I've still got them in my collection. I've never sold any. Follow up Q. Ok, because Frank says that he's seen them listed on your ebay account even though you knew that they were not correct and he told you 6 months ago (edit - should be 6 months before hand) that they weren't correct. You're saying that's not true and they weren't on your ebay account? Jeff - No. I haven't sold a red text baggie on my account. I can't remember... I've got 3 red text baggies....this was about 5, maybe 4 years ago and I bought them all. I said to Frank, "have you seen these before?" and he said "I think they're fake". And I said ok. I've still got them. I've still got them in a box. But I've not sold them on. Because.. you know. I'm a little bit dubious sometimes because Frank says sometimes that something may be fake or not legit then all of a sudden it pops up on his site, actually these are determined legit... I don't like taking them out their bag really because just in case that bag was legit..... somebody said I should destroy them just in case they got in the wrong hands, it's a good point.... I didn't think it that way. Follow up Q. 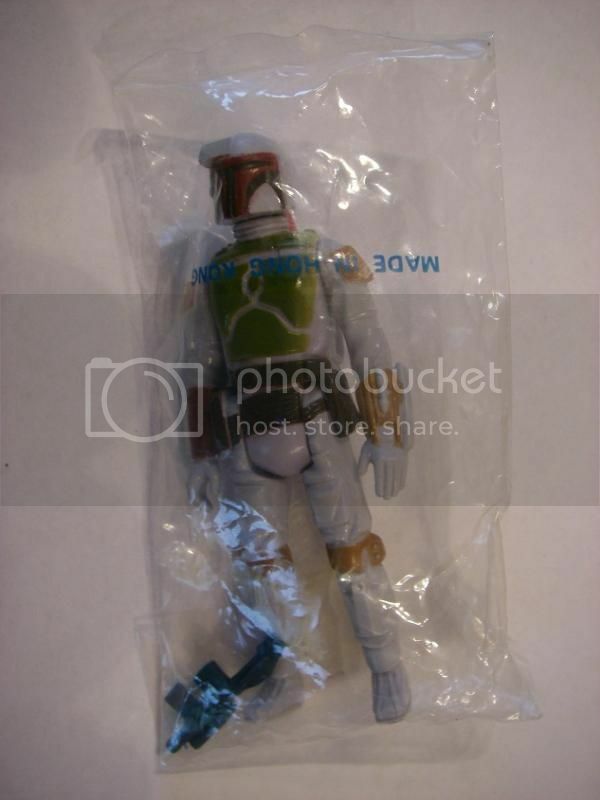 So, I'm going to clarify that because a couple of people have asked about the red text baggies... you're saying about 4-5 years ago you contacted Frank about these red text baggies... he said they're either fake or rebagged from another toy line.... and then he said 6 months after that date they were listed on the ebay account. You're saying no, that's not true. Jeff - I can't remember ever selling these erm.. they're folded....their almost rolled, someone tapped them and then they've stamped MIHK over the top, and they've gone over the top of the cellotape as well, when you take the cellotape off the actual Hong Kong stamp is on the cellotape. There's (indeciperhable) on the bag first it's been taped over... I've never sold. Did anyone show me where I've sold that on ebay? I've never sold one on ebay as far as I can remember. Follow up Q - that's a good point. If any of our listeners is aware or has any evidence at all of a red text baggie being sold on ebay we'd like to see the picture. Jeff - I've never seen the red baggie being sold on ebay. I do know I have a red text made in macou (sp?) baggie which is on Frank's site there... and that's got red text on it and I asked Frank about that and he said that's genuine... (then goes into a description of baggie with O and U)... and I want to show Frank...I wouldn't know the value of that.. I put things a higher value to see if they sell, if they don't sell I drop it by £10 or £15. If they don't sell I take them off and put them back in the box. I just see what sort of interest there are on it. It's not that I need to sell them. 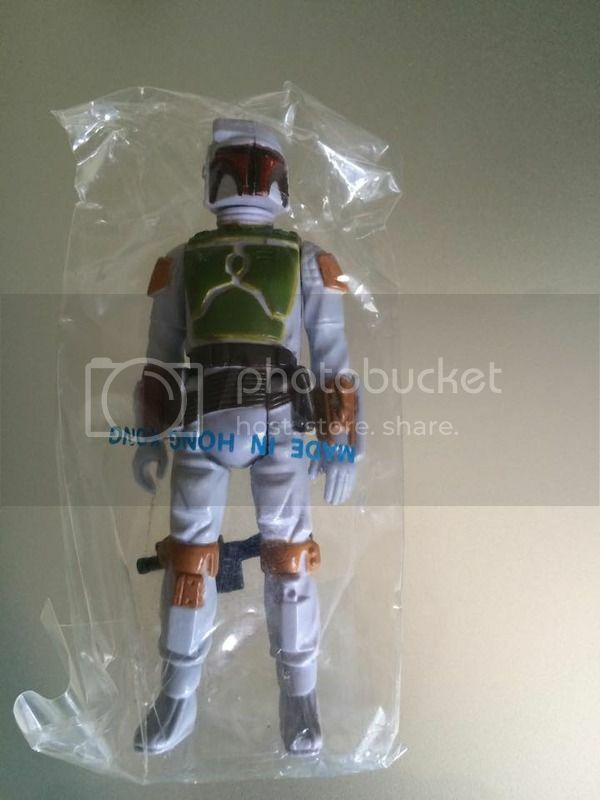 I received your Boba Fett figure and just examined it. Unfortunately I do have to agree with AFA on their outcome with this piece. It has had paint touch-up at some point in time both on the nose and the belt. It is tough to see with the naked eye but under an 800x microscope it is very clear. I also noticed and believe the rocket has been replaced on this one as well. There are small pry marks on the top of the rocket holder and with the Palitoy Fetts the rocket can be removed since they aren't sonic welded in like the US versions. I've attached a few pics from our scope, take a look at them and I think you'll see the touch-ups for yourself. It was later resold, note the crease is exactly the same. It also has a blue Han Hoth/Luke Bespin blaster. Baggie weapon errors do happen but are not common. I contacted Frank on 22/09/2015 with regards this Han baggie which he has on the guide as it remained unconfirmed. Frank confirmed he had previously he bought from Jeff and returned it as Frank stated I bought it, checked it & also asked Steve about it, sent it straight back for a refund as I can not confirm it & it does not conform to any other baggies types I have identified".